Drakenstein Stud’s five time G1 winning stallion Duke Of Marmalade had a weekend to remember, with the Cartier Champion making waves both as a sire and as a broodmare sire. Duke Of Marmalade’s 3yo daughters Temple Grafin and Santa Clara (both members of the champion’s first South African crop) finished 1-2 in Sunday’s G3 Umzikhumulu Stakes at Greyville, giving Duke Of Marmalade a clean-sweep in the finish to one of the major KZN Fillies Guineas trials. 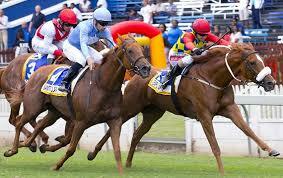 The Fran Cowe bred Temple Grafin, Cape Racing’s Champion Juvenile Filly of 2017-2018, picked up her second graded victory when running on strongly under Anton Marcus to score a 0.4 of a length win in the R250 000 Umzimkhulu Stakes, with her paternal half-sister Santa Clara making a promising KZN debut back in second. Trained by Glen Kotzen, Temple Grafin, now a winner of 3 of only 8 starts, took her earnings over R500 000 with her graded win on Sunday, with the classy filly’s previous victories including the 2018 G3 Gagasi FM The Debutante. A half-brother to G1 Investec Derby winner and promising sire Ruler Of The World, Duke Of Marmalade’s first South African crop, now three, also includes Listed Ardmore Jamaica Handicap winner Princess Irene and recent G2 Wilgerbosdrift SA Oaks third Seville Orange, while his second local crop includes brilliant recent debut winner True To Life. Overall, Duke Of Marmalade is the sire of 38 stakes winners, including five G1 winners, and has a total of 64 black type performers to his name. Duke Of Marmalade, whose 3yo son Duc D’Orange had caught the eye when shedding his maiden at Greyville on Friday night, also made news in Ireland over the weekend. His G3 Ballycorus Stakes winning daughter Wannabe Better is the dam of promising 3yo filly Lady Wannabe who romped home to break her maiden second time out by two lengths over one mile and half a furlong. Lady Wannabe holds an entry for the 2019 G1 Tattersalls Irish 1000 Guineas. Duke Of Marmalade, whose daughters had previously produced such group winners as Chilean and Antonia De Vega, has 16 yearlings on offer at the 2019 Emperors Palace National Yearling Sale, including a half-brother (Lot 26) to the stakes winners Arezzo and Insignis, a filly (Lot 132) out of G2 winning millionaire Louvre, and a colt (Lot 331) out of G3 Prix du Cap winner Cuvee Brut.